If you've been around the blog for a bit, you know I'm a sucker for pancakes. On Thursday, since I was home due to the snow, I tried a new recipe. It comes together very quickly and doesn't have a lot of ingredients. Simply called "Oatmeal Pancakes", that's the main ingredient. 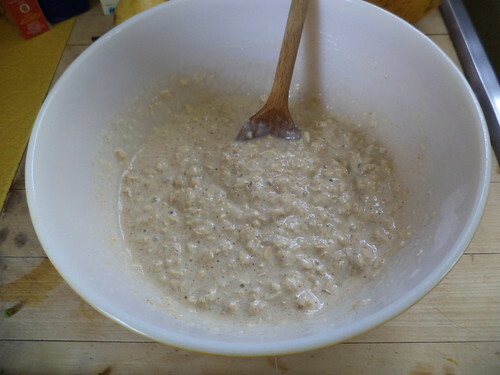 Other oatmeal pancake recipes I have use an equal amount of oatmeal and flour but this does not. It's 1 cup of quick cooking oats and a quarter cup of flour, mixed with a quarter teaspoon of cinnamon and an eighth teaspoon of salt. You mix together in another bowl, one egg, 1/2 cup of vegetable oil and 1 cup of buttermilk. Pour that into the dry mixture and mix only until moistened. The batter was quite soupy I thought. 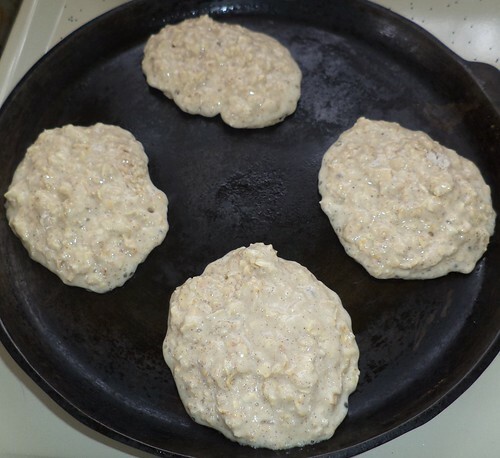 Spray a griddle with cooking spray and drop batter by 2 1/2 tablespoons onto the griddle. I think that's bunk, frankly. I took a quarter cup measuring cup and scooped that amount onto the griddle. Plus, I don't use cooking spray. I know I have mentioned this before. It's one of my pet peeves with Cooking Light, their huge over reliance on cooking spray. If you read the ingredient list of cooking spray, there are things in that, particular propellants, that we shouldn't be eating. Heat your griddle and slice a thin bit of butter, at best, a teaspoon's worth. Run that around your skillet and pour on the battle. Or use a non-stick griddle and forego the spray or the butter altogether. I'd rather have the few extra calories from real creamery butter than the probably derived from petroleum stuff I can't pronounce that's in cooking spray. Let the pancakes cook until they stop producing little bubbles in the batter. This is a crucial step. Turning the pancakes any sooner and they won't be completely cooked through. Plus, with these pancakes, heavy on the oatmeal, the first batch tended to crumble because I didn't wait for the whole pancake to cook. Here are the finished pancakes. This recipe doesn't make a lot. I got 8. If you have more people to feed than 4 or they want more than 2 each, you'll need to make more than one batch. With warmed maple syrup, these were pretty good. I put them in bags of 2 each and froze them. They heated up nicely, for a minute, in the microwave. I liked the large amount of oatmeal in these. It really was cooked oatmeal held together with a small mount of binding agent. The addition of cinnamon made the house smell very good when these cooked. 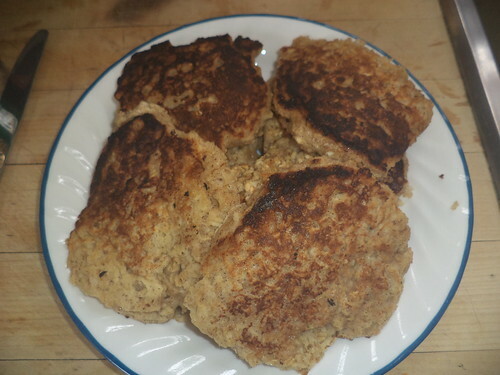 If I want a lot of oatmeal pancakes, I have other recipes I'll use, but, if I want pancakes quickly, these went from start to eating in 15 minutes. The addition of warm applesauce or sausage would really make this a full meal.